……Ambassador challenges Zambians resident in Germany. Zambia’s Ambassador to Germany His Excellency Anthony Mukwita has challenged Zambians living in Germany to go into business and deal in products and services unique to Zambia. Ambassador Mukwita cited food products and handcrafts made in Zambia, which he said could be sold in Germany. “We have Ethiopian, Nigerian and Kenyan restaurants, I would love to see a Zambian restaurant where I can eat Zambian foods”, the envoy told more than 100 Zambians that gathered at the residence of the ambassador to toast the country’s 54th independence anniversary. Zambia had two independence events – a business event held on the 26th of October at Maritim Hotels and a family event at Zambia House that brought Zambians from as far as Finland. “Why should Zambians work at an African restaurant when they can run their own”, Ambassador Mukwita asked drawing an enthusiastic response from an audience member who shouted and pointed at another Zambian in the audience who once ran a Zambian restaurant but had discontinued it for unknown reasons. “I will start”, Martha Bwalya who had run her restaurant for seven years responded amid cheers from an engaged audience. Ambassador Mukwita said the restaurant business was but just one example of the many goods that Zambians could trade on the German market. “Zambia has so much to offer that I challenge you to consider”, the senior diplomat said. With the current diplomacy focused on economic matters under the leadership of President Edgar Lungu, the embassy in Berlin has been exploring how to increase trade between Germany in Zambia. The trade deficit between the two countries is wide in favor of Germany but Zambia could narrow the deficit with more exports especially of non-traditional goods which may include precious stones, crafts, food stuff and many more. In July, while in Slovenia where he had gone to present his credentials, Ambassador Mukwita met a businessman looking for products from Africa that he could sell on the European market. “This is an opportunity that Zambian entrepreneurs have and ought to take advantage of” the Zambian envoy said then. The Zambian economic diplomacy has seen an increase in German businesses seeking opportunities to invest in Zambia resulting in employment creation. The embassy in Berlin is exploring ways to compliment this development with Zambians investing in Germany. 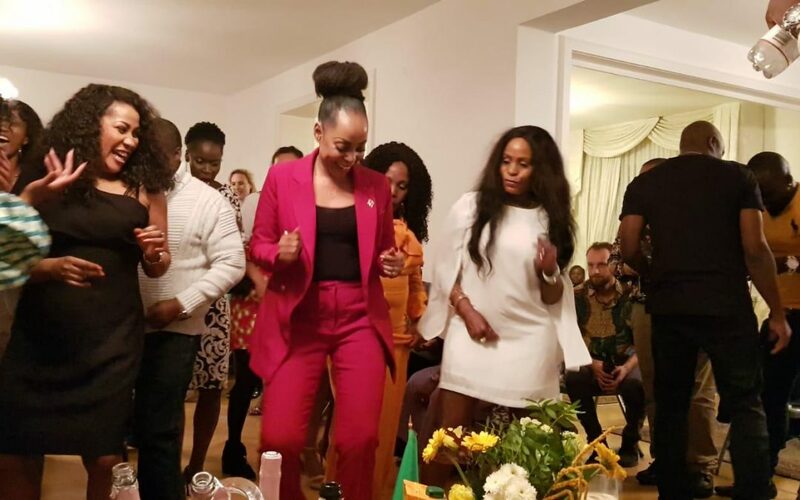 CAPTION: Mrs. Elaine Mukwita in red joins other Zambians on the dance floor along diplomats from the Zambian embassy that included Counselor Ms. Irene Mulonda in green dress, First Secretary – Tourism, Ms. Susan Katema in black dress.